Many knows this name now. But I am not sure how many of you knows this is not just a film name but there was a tigress lived in Warangal once. Just before the movie release Yathra Magazine published a travelogue about Kakatiya Dynasty and their doyenne Rani Rudramma. 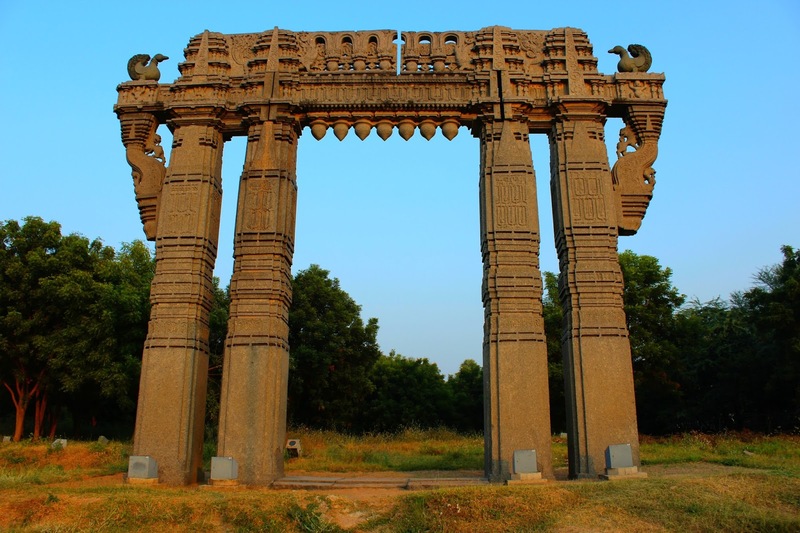 Since then a new destination was ringing in head - Warangal. From Trivandrum its 26 hours journey and up and down I need 4 days for this trip. Casual leaves was preserved for next year where sick leaves were there and it was almost end of November. So as per planing, booked tickets in Korba Express and started early morning from Trivandrum. Before I cross state border, I got a very good companion till I reach my destination, a retired fellow in late 60s, returning to Raipur after his visit to home town Pala. Time passed by as we both started chit-chat about me and then how he settled down at Raipur. On next day morning before I leave train, he shared his address to sent a copy of my book. Train was late by 1 hour at Warangal. It was 10AM when I walked into the reception of hotel which I booked, close to railway station. It was a confusion again, that they haven't received yet my advance payment from Stayzilla.com. They promised to settle down it before I check out. Room with television and neat bed with attached bathroom for just 300rs! Felt really thankful to Stayzilla's discount features. First thing to do was to run for a shower. It was getting hot outside. After getting fresh, stepped out of hotel. I got a warning already that there is no hotels nearby, so have no other option but adjust with my biscuit pack in bag, else in hunt of a hotel I will spoil my first day's precious time at Warangal town. First destination was Ramappa temple which is built during the the period of Kakatiya ruler Ganapati Deva. To reach here, have to travel 77km from Warngal. As I planned to opt local transportation, before leaving hotel reception I inquired about the near by bus stand and the availability of bus. Hired an auto to Mulagu cross road when the traffic was at its peak. With the help of traffic police at Junction I found a bus to Mulagu, from where I have to find next transport option to reach till Palampet where we can see wonders Ramappa, old Vijayanagara Architect . But the bus was leaving the stand as I approached one of them but the traffic police whistled and stopped it few meters ahead. 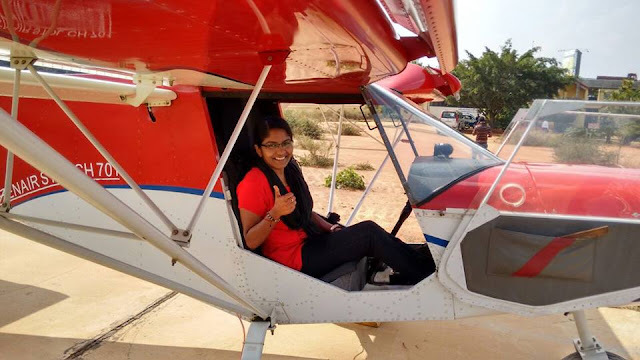 Thankfully I got a side seat to view the villages of Telangana and to feel the even more dry climate. Bus was filled with farmers and those returning to Mulagu after some purchase in Warangal. I put my GPS on to know how much kilometers to cover to reach but it was unnecessary, driver called me when my bus reached Mulagu bus stand. I came to knew that there is no bus to Palampet but have to hire an auto rickshaw from near by auto stand. After a bargaining with 2 drivers, settled with 350rs (Which was cheap when compare to 600 what they said in the beginning). I got into the auto and it started heading to my destination. The roads were so empty and few cow carts crossed our road many times since we started from Mulagu. Rice field at either side reminds me of journey to Konark from Bhubaneshwar. It was yellowish and light green at places and when the view ended we started riding through the thick and tall trees and that ended at Palampet town. Auto driver told me he can wait outside. From the main gate I can see southern side of entrance. The tower of temple which was made by the floating stones, welcomed me(This is the same stone which Lord Rama used for Rama sethu construction). I moved along the dotted lines of trees through the lush green garden, which was royal path once. 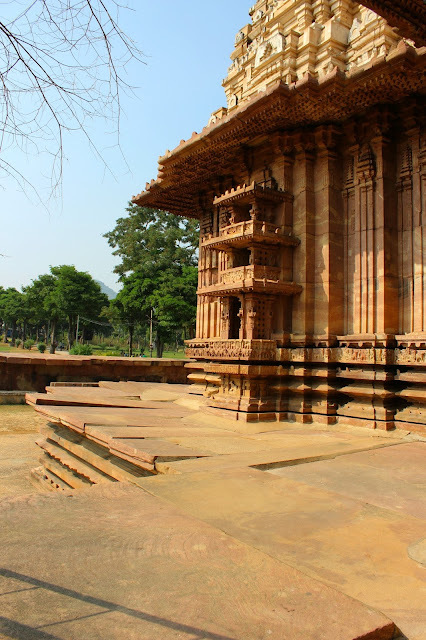 Main entrance of the temple is completely ruined now and we can enter through a small gate and can see small model of Ramappa Temple built in the same compound of main temple. Both are in same compound wall. Main temple are situating at the height of 6ft and it survived many earthquakes and wars. 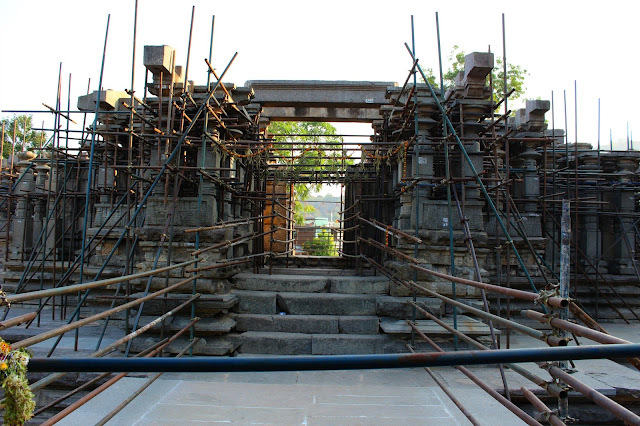 Construction with the floating stones was Ramappa's brain to withstand the earthquakes and to stay strong, which is still. 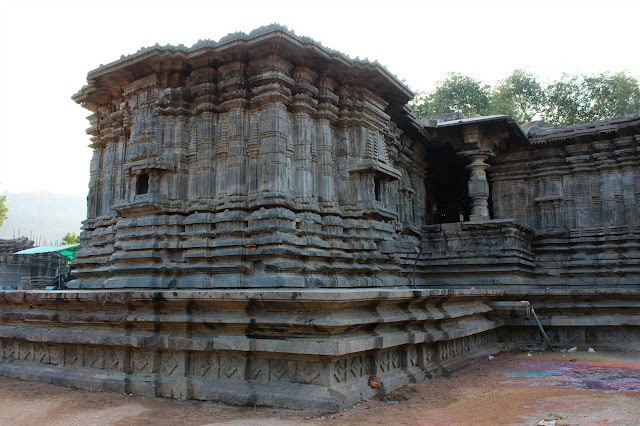 May this is the only temple in country which is named after its constructor, Ramappa. The temple is shivalaya - worshiped Lord Ramalingeshwara. Main structure consists of a garbhagriha, an antarala, and maha mandapam. 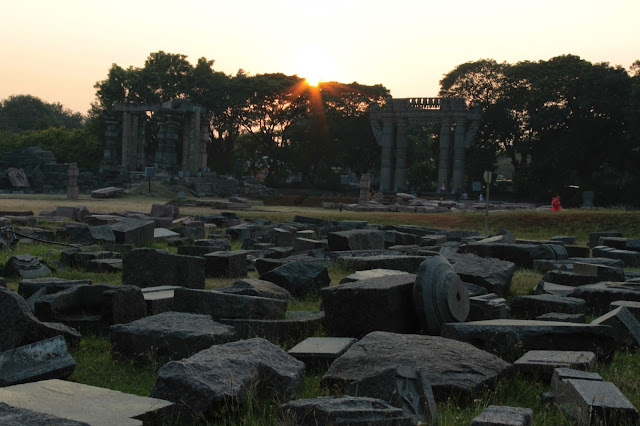 Also two subshrines are there Kameshwara and Koteshwara, both are complete ruins now. 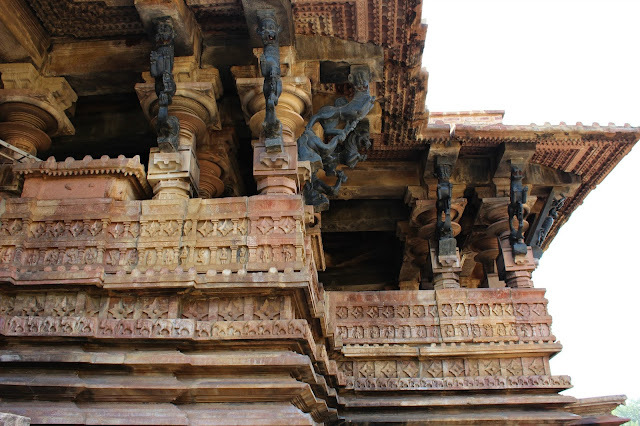 On walls of main temple you can see carvings depicts from Hindu epics Ramayana and shiva purana. Also different forms of classical dance and instruments you can see among the sculptures. 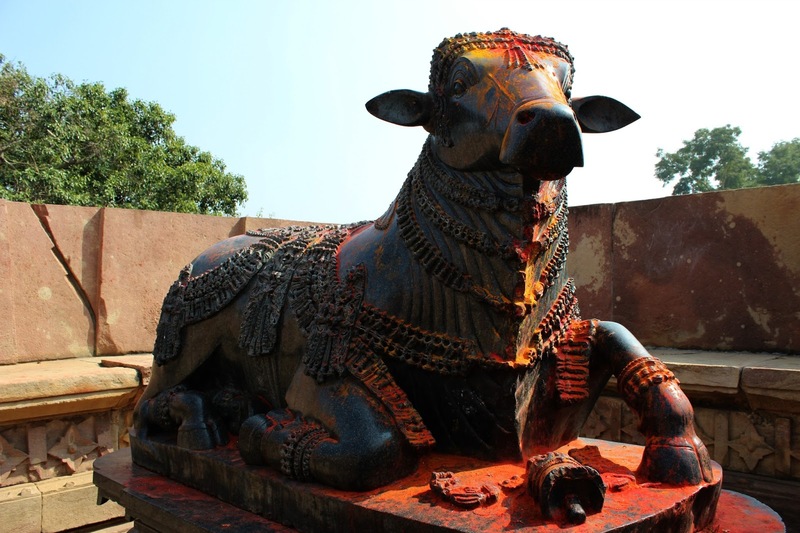 You can see an attentive posture of Nandi infront of temple. The carvings on Nandi is remarkable. Among the amazing carvings include a flute at the entrance of sanctum which make the sound sa-ri-ga-ma when we hit on the pillars. The pillars within the temple boast of such a fine carvings that one could pass a strand of hair through. Also 300 unique structures of elephants around the temple is another wonder of this temple. When you look closer to the dancing postures of ladies in carvings, you can see they have some footwear on their feet which resembles as chappals with high heels which is a trend for nowadays among the ladies. 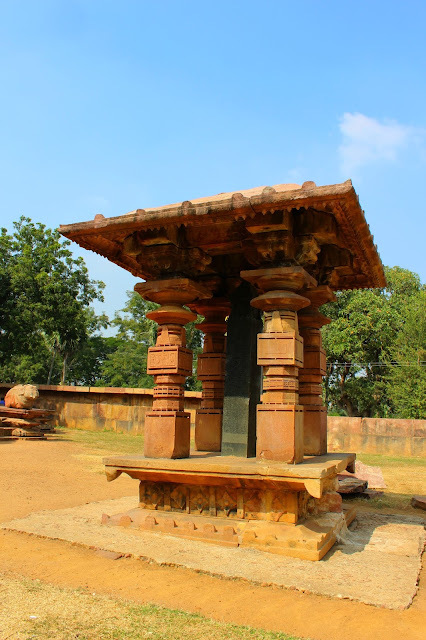 They used red sand stone for the temple while black granite was used for carving out amorous statues adorning the temple outside connecting roof and walls. The temple was floating with visitors from near by villages and from Hyderabad city. Unmarried girls were performing few ceremonies near Nandi and it was hard for me to get a picture of temple without a single person in my frame. I left the premises in 2 hours and I must say this is the structure you should visit once in your life time. My driver was waiting near the temple entrance and I tried to click a picture of mine with the help of a visitor at temple but it was an utter failure. Auto drove me back to Mulagu and from where I got bus to Warangal after waiting 15 minutes. By then school kids were filled in and I reached the city around 4.30. I called another auto to Thousand pillar temple at Hanumakonda. The first vision of temple torned my heart. It was another perfect example of invasion of Thughlaq dynasty to the Deccan. Since 2004 Government has initiated many renovation here but it was not perfect as it was build during the ruling period of Rudra Deva. This main sanctrum is built a platform which is in shape of a star and it has a perfectly finished monolith Nandi made in black basalt. There are 1,000 pillars in the structure infront of temple, but no pillar obstructs a person in any point of the temple to see the God. The entry was restricted as renovation process was on progress. There are three shrines inside the temple called the Trikutalayam, dedicated to Shiva, Vishnu, and Surya. 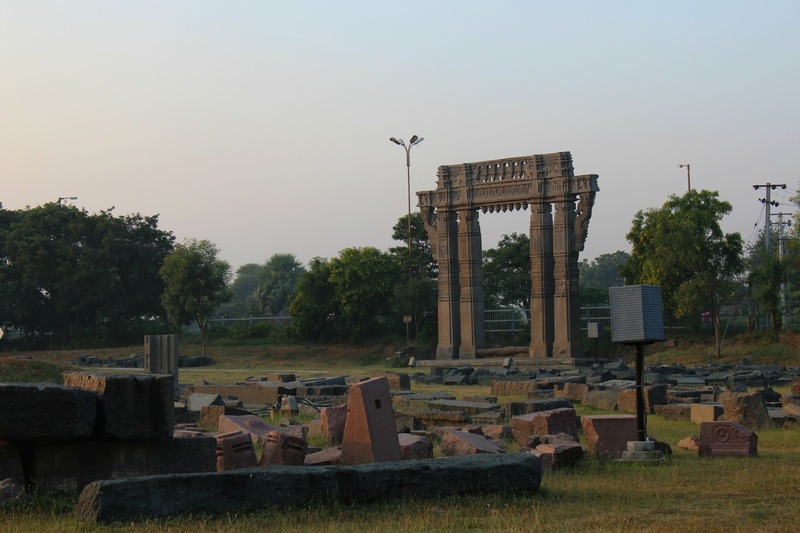 After spending few more minutes there, I hailed another auto, this time destination was Warangal Fort. It was already 5.30PM and it was doubtful whether I can reach there on time before they close it. But surprisingly it has many visitors at that time too. But the expectation of fort "died" when I crossed one of the "Toranam"(entrance) of fort. Thughlaq's Army has done its best to the fort. Fallen pillars, broken sculptures that was all over the courtyard of Fort. Even in that state it all look marvelous. First time felt respect and sympathy towards Kakatiya Dynasty. Spent few minutes in and around the courtyard and then moved around the ruins. Thats how I met Ranjith, care taker monuments and he mentioned about the light and sound show of the fort. I was hesitated to stay back as it will be too late to reach back to hotel. When I look at the chart, it was showing Telugu first and then English, even more later. I stood up from my bench to leave and met Ranjith at main gate. One last time asked him is there any possibility to change the language. He said officials are coming so he cant change. But before I step out of premises I saw him running towards me, saying that they are showing English first. It was a privilege for me and more than that I was the only audience for the show. Sitting alone amidst the ruins and watching the show. It was like I was seeing Rani Rudramma running in front of my eyes and her father looking at her with so proud and it was more painful to see her fall in war-field with a back stab. Before I leave the Fort, Renjith give me few brochures of Warangal Monuments and then there was a pot kept which have floating stone in it. I was thinking this one is worshiping at Rameshwaram but here its a wonder show piece of Ramappa's construction.